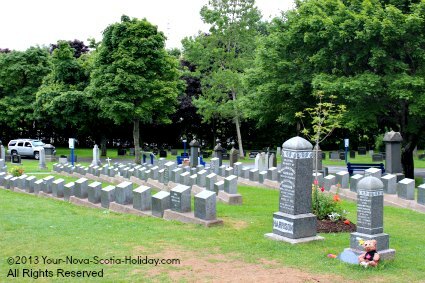 Visiting the Titanic cemeteries is a heart-wrenching experience. I was not sure what to expect and found myself pondering what it must have been like for the people on the Titanic that fateful night. And what it must have been like for the people of Halifax and how the tragedy overwhelmed the city. I did not see the cemeteries as a tourist attraction but as a place to pay solemn respect to all who perished and as well to those who survived. The 3 cemeteries used were Fairview Lawn (121 graves), Mount Olivet (19 graves) and Baron de Hirsch (10 graves). Each cemetery has informational panels indicating the location of the grave sites. A visit to these sites can be quite emotional given the extent of the tragedy. 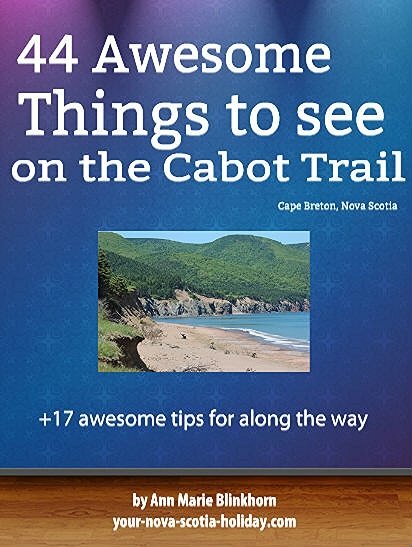 I have created a map so you can see the location of the cemeteries and their distance from the Maritime Museum of the Atlantic where the permanent display is kept. I met a lady from Australia when I was there last summer. Her great uncle perished in the sinking and she was looking for his gravesite. She did not seem to know much about what else there was to see so I gave her my map of the titanic interest points. She was so grateful. 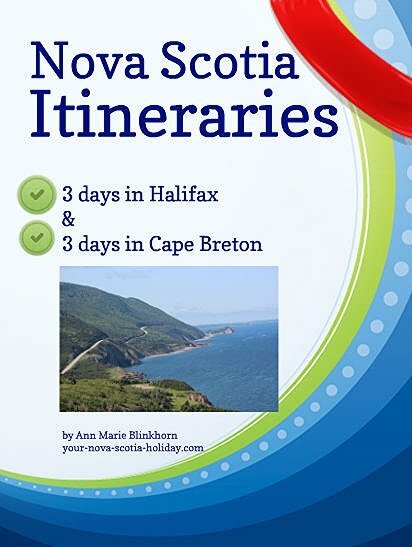 She was amazed at the Halifax connection to the Titanic. 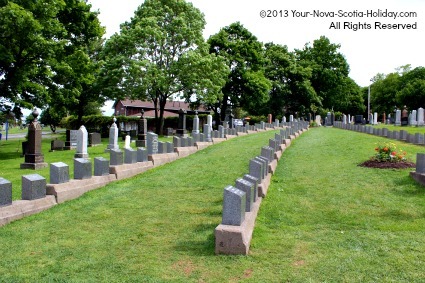 The layout of the tombstones at Fairview Lawn is interesting. They are arranged in the shape of a ship's hull. Most of the grave markers are the same. These ones were paid for by the owner of the Titanic. Some graves remained without any names for a long time. Modern technology has helped to identify those graves without a name. Information markers in the cemeteries explain how this came about. 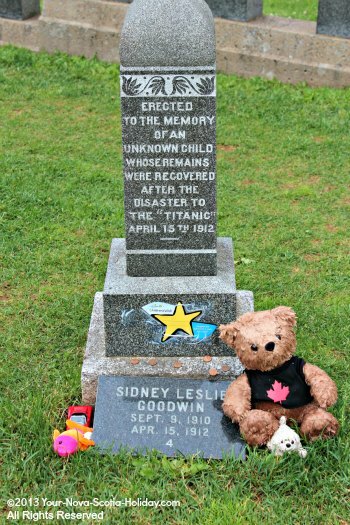 One thing that cannot be missed is the grave of the ‘unknown child’ at Fairview Lawn. This can be especially heartbreaking. When no one came forward for the little boy the crew of the cable ship that found him, the Mackay-Bennett, took care of the funeral arrangements. To this day, visitors leave flowers and teddy bears for the baby. 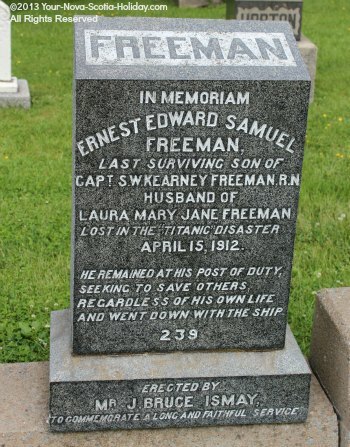 This is probably the most sought after gravesite in all of the Titanic cemeteries. 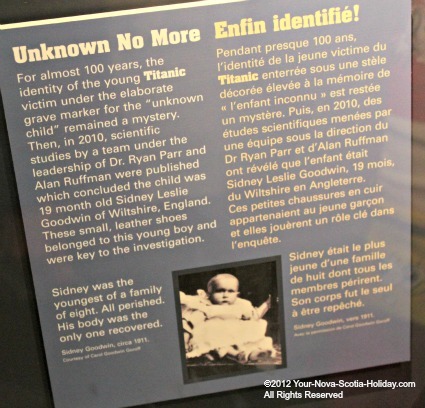 It is remarkable that 95 years after the disaster, DNA testing was able to identify the child as Sidney Goodwin from Britain. His parents and siblings also perished. 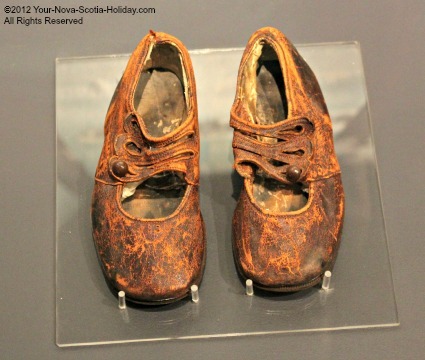 And then there is the pair of child’s shoes that were donated to the Maritime Museum of the Atlantic in 2002. They came from the family of a police sergeant who was working in Halifax at the time of the disaster. The Halifax police department was given the responsibility of guarding the personal belongings of victims. A small pair of shoes was among the belongings. Instead of seeing the shoes destroyed the police sergeant kept them. The story and the shoes remained in the family. The sergeant’s grandson decided in 2002 to donate the shoes to the museum. After much investigation the museum was sure that the shoes were authentic. They were also very sure that the shoes belonged to the little boy known as the ‘unknown child’. The shoes are now on display in the museum. Halifax will never forget little Sidney Goodwin.